With eager faces, members of the robotics team from Holy Family School in Port Allen grabbed base plates, iPads and bins of Lego pieces and started to work. They were building, creating and coding. However, these students aren’t just playing around, they really understand the challenges and how to execute the program. So much so that the fourth- through eighth-grade robotics team qualified to attend the First Lego League state tournament at Jesuit High School in New Orleans on Dec. 15. Twenty-five second- and third-grade members of the Holy Family robotics team also attended the First Lego League Junior Expo, held at Jesuit on the same day as the state tournament. Team members on the junior level were recognized in a number of categories including “Inquiring Minds,” “Show and Tell,” “Artistic Eye,” “Complexity and Decoration” and “Efficient Builders.” Students also received participation medals. For seventh-grader Blake Weber, this was his second time to attend state competition. It’s something he never gets tired of. 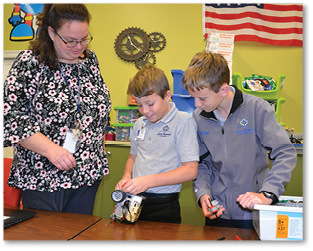 According to Cagle, robotics at Holy Family is increasing in popular. She has seen the program grow steadily over the past four years but she said it really took off this school year with a total of 38 students in the fourth- through eighth-grade level participating. It’s especially impressive considering that the amount of time devoted to athletics increases with grade level, leaving less time available for other extracurricular activities. She also credits older siblings involved in robotics with influencing younger students. Weber’s younger brother, Mason, is in the second grade and is also involved with robotics. He attended the FLL Junior Expo while his older brother was competing in the state tournament. “I like building and coding,” said Mason. According to Cagle, the students postulated that the astronauts could receive muscle stimulation, such as with a TENS (transcutaneous electrical nerve stimulation) unit, as they continued with their daily activities on the spaceship. For competition, the students had to research electrical stimulation.